Nickel-bearing pyrites in mangrove sediments of New Caledonia. The microcrystalline Ni-rich pyrites are the most sensitive to re-oxidation by oxygen rich-water brought by the rising tide. Their oxidation causes partial remobilization of nickel toward the sediment pore water, and ultimately, toward the lagoon [Noël et al. 2015]. 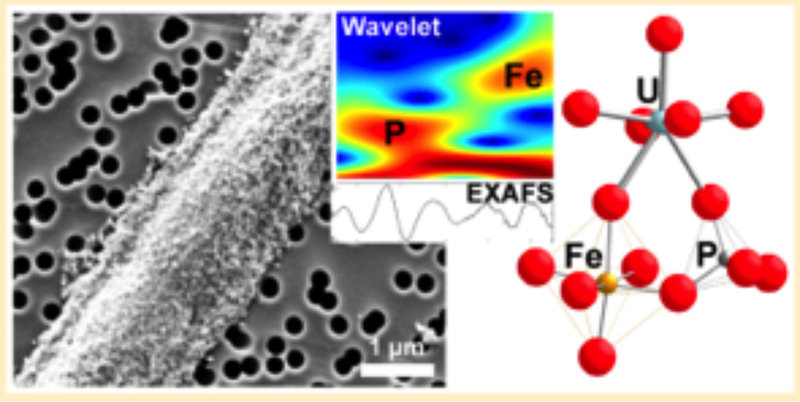 EXAFS spectroscopy at the U LIII-edge showing uranyl UO22+ sorption complexes at the surface of amorphous iron phosphates. These amorphous mineral phases precipitated on the surface of filamentous bacteria of the Sphaerotilus natans type which can form fixed biofilms. [Seder-Colomina et al. 2015]. Remarkable properties (A) of nanomagnetite able to oxidize organic contaminants via Fenton-like reactions [Ardo et al. ES & T 2015] and (B) of biogenic hydroxycarbonate green rust, a lamellar iron hydroxide mineral able to reduce nitrite ions to nitrogen gases [Guerbois et al. ES&T 2014].